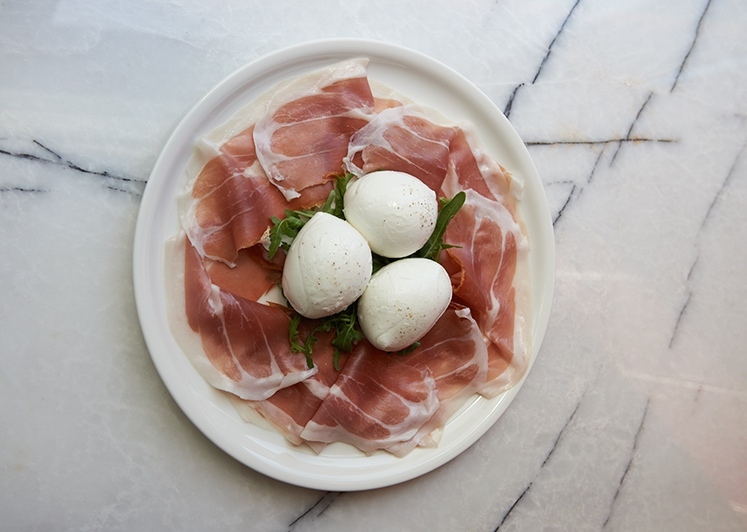 Da Orazio is Bondi's answer to Italy's Amalfi coast. White washed walls and furniture, a huge wood fire pizza oven, dough spinning chefs, Italian accents everywhere and a cabinet filled with top quality meats and cheese. If you dine early, you can expect it be like a rowdy child centre with kids everywhere and yummy mummies poking at their pizzas. But once 7pm hits, there is a better buzz, swift service and some of the best Italian food in the city I have done PLENTY of research to be able to have the authority to say that (and by research I mean carb loading). As the name suggests, they’re all about pizza here. The dough is made in-house and left to rise for 48 hours so there are no crusty cardboard-like bases in sight. I have tried almost all, and they are all worthy of ordering. But, I strongly suggest you dart your eyes across the right hand side of the menu and marvel at the FOCACCIA CON PORCHETTA. This piece of art is pretty much a pork pizza sandwich. The deboned rolled pork which has been roasting all day is carved into juicy pieces and stuffed in between two warm pizza bases alongside a touch of mayo, lettuce and eggplant. Heavenly. The pastas are a pretty strong contender too - they change often but the ragus are always amazing and the pasta is always made in-house. To top it all off they make a damn fine cocktail too. My go-to is the grapefruit juice, campari and vodka on ice. The house wine is cheap too so the bill is always surprisingly cheap when you dine with a group after eating and drinking like a king. The bitter: long wait times - you either need to book in advance or eat an pensioner hour. The sweet: pork pizza sandwich... obviously. The damage: dinner and some wine for 2 will cost about $70. The details: Da Orazio is located on the lower ground of The Hub at 75 Hall Street, Bondi Beach.